I don’t want to break the album into pieces. It’s all good. Every song. But I will give a couple highlights that’ll really sell the hell out of you on this album. 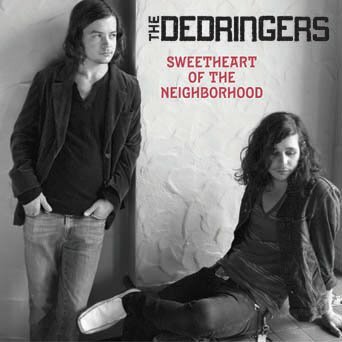 The title track “Sweetheart of the Neighborhood” is the sweet bless-ed song that’s going to get these guys onto the international radio waves (or intergalactic satellite waves) and as James McMurtry put it, on into “the Hollywood bowl.” It’s a dance and get rowdy song that no one couldn’t love. (I saw them play it at Austin’s Saxon Pub almost two years ago and watched as a dark dive with two drunks and a lonely ol’ gal transformed into the best town square party any little town never saw.) Next, highlight: the riff on “Institution.” It’s like they took Keith Richard’s riff on “Last Time” out drinking for the first time in its life. Make that whiskey and in a Texas barroom. Lots of it. “Josephine” is a sweet skip in the rain with the one that never got there or the one that got away. It’s a song that brings a tear and a smile to you while you say, “Uh-huh,” and wonder how these fellas can cut into the truth so easily. “Nothin’ in the World” is like any of the softer songs off “Blonde on Blonde,” “Between the Buttons,” or “Rubber Soul” after she’d been loved, beaten, healed and learned how to step the Tennessee waltz with a pistol in her boot (in a Texas barroom.) This is how “Heart of Gold” was created. Townes’s ghost came to the Dedringers. They told him a joke, and then that smiling old spirit jumped into their bodies and the Townes channelers penned “Gold.” It’s a song that seems to have come so naturally to them but does a Townes thing better then any of the others who’ve contrived to do so. And last, the closer “Come with Me” is a majestic sailboat ride in dark clouds that is so different than any of the other songs with its painful whistling hook, but so beautiful and appropriate at the same time you can’t help but thank somebody for it. It is what invites you to start the record all over. And so you do. And so you should.